In a teardown of Apple's new Lightning cable, semiconductor and electronic systems analysis firm Chipworks found an unpublished Texas Instruments chip that is likely to include a security feature, which Apple may be leveraging to stop third-party accessory makers from building unauthorized products. AppleInsider was first to report on the existence of what appeared to be authentication chips in Apple's new Lightning connector, noting at the time that the cable's design likely thwarts clones of the 30-pin dock connector replacement. Chipworks has now confirmed that there are indeed four chips embedded in the Lightning cable assembly, including two transistors, an NXP NX20P3, and the aforementioned TI chip. After removing Lightning's sturdy shell, the firm took a closer look at the die to discover it bore the marking "BQ2025," a part number not published by TI. The chip maker does have material on the BQ2022, BQ2023, BQ2024, and BQ2026, however, with the four parts catalogued as battery fuel gauges. Chipworks pointed out that while the four chips are not identical, they do share certain "common characteristics." "All use a single wire SDQ interface (TIs proprietary serial communications protocol), and all have some basic security features such as CRC generation," Chipworks noted. "So, it is certainly likely that the BQ2025 does have some security implemented on it. It would also seem likely that it includes an SDQ interface." 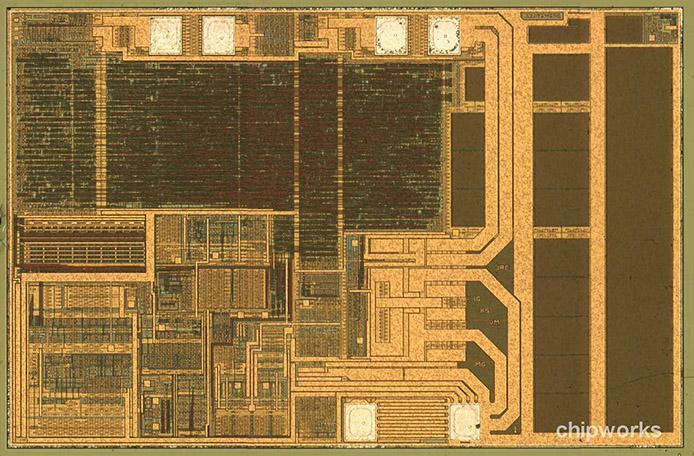 Lending more evidence to the theory that the unknown TI chip is a security device, Chipworks' lab investigation yielded a lower metal sample view which allowed the firm to see further details like a digital logic block containing "about 5K gates of logic." Also discovered was the EPROM (erasable programmable read only memory) "with likely 64 or 128 bits of storage," large driver transistors, analog circuitry and "a fair amount of capacitance." Die-level image of the TI chip. "This is certainly all consistent with a serial communication chip including some simple security features," Chipworks concluded. The presence of the security device comes as somewhat of a surprise, as the firm has previously seen such measures taken in medical printer media (armbands), printer cartridges, flash drive memory, and other secure applications, but never before in a cable. That being said, the TI chip is not on par with current security technology like that used in printer cartridges. Instead, Apple's Lightning cable is reminiscent of tech manufacturers used in "the olden days," and is possibly an attempt to keep costs down for the already pricey component. "In other words, at this time the security is 'just enough,'" Chipworks said, adding, "With future generations of Apple and non-Apple products, we may begin to see even stronger security and control if the market forces merit it."